We have recently streamlined the GIC book collection to create more space for new books and medias, over 1000 books and atlases have been removed! Please drop by the GIC and browse through these items. 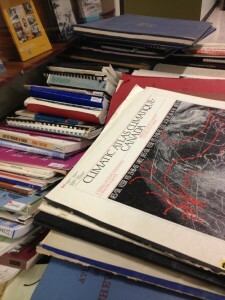 Books and atlases are located outside the GIC entrance and are free of charge. 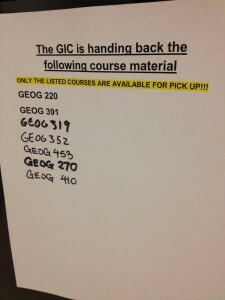 Final papers are now available for pickup at the GIC! Papers will be available for pickup til May 31, 2013. After this date all materials will be handed back to the professors. Have a nice summer! The GIC has received the entire aerial photo collection from the BC Provincial Government earlier this year and will be undergoing various renovation projects this upcoming summer. 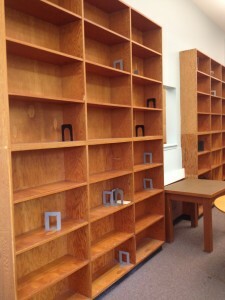 During the renovation the GIC book collection will be unavailable. Please visit the renovated GIC in September 2013!